When it was all said and done, after much debate and consternation, the December 3rd bout between Antonio Margarito and WBA junior middleweight champion Miguel Cotto- the grudge match of the year- will take place at the very same venue where it was scheduled from the very beginning, the famed and newly renovated Madison Square Garden. For about a week or so, it seemed as if the New York State Athletic Commission was intent on putting the kibosh on this fight, with concerns over the condition of Margarito's right eye, which went through multiple surgeries in the wake of his bout last November versus Manny Pacquiao. On Tuesday afternoon, after Margarito was flown in from Mexico to undergo examinations from a doctor selected by the NYSAC on Monday, he was given the green light to face Cotto in their jurisdiction. Of this ordeal, where Top Rank was left in limbo and forced to make contingency plans, including possibly staging the fight in Denver or Phoenix, a beleaguered yet relieved Bob Arum told Maxboxing, “It's been terrible. It's been very, very hard. Hard on everybody and we've lost a lot of time that we could've devoted to promoting. But people tell me that THIS was the promotion what happened and it's been better than what else we could’ve been doing. I don't know, probably so. It's a big fight. [HBO’s] ‘24/7’ was incredible. The next ‘24/7’ is going to be like the most amazing one that they have ever had but it's just a strain on all of us, a strain on Antonio, flying him in from Mexico on a Sunday, putting him through two eye examinations on Monday. The question must be asked: Is Margarito's eye fit to fight? Can Arum now say he's seen it all? “No, because next year, I'll see more. That's what makes it fun to be a promoter. Nothing is ever the same, things happen all the time,” said Arum, chuckling. For him, this is old hat and after Muhammad Ali vs. George Chuvalo, everything else is easy by comparison. “The first fight that I did, we got chased out of the country,” recalled Arum of his attempts to stage Ali versus Ernie Terrell, which ended up seeing Chuvalo face “The Greatest” instead in March of 1966. “I had one pair of shoes. I wore them out. I'll never forget; I had a hole in my shoe and then going to Toronto and then the Ontario Parliament voting on whether to allow them to fight- and we won by one vote. And Harold Ballard, the co-owner of the Maple Leafs and the Maple Leafs Garden, he was confronted by ‘Connie’ Smythe, who said that if you allow this guy [Ali] into the building, ‘I'm going to prevent it.’ And so Ballard had to buy [Smythe] out of the team and the building. Sergio Diaz, who has co-managed Margarito for much of his career, insists that his client is at no more risk than any other boxer who steps into the ring. “He is absolutely ready to go. We would not put Antonio in any situation that he would not want to be in and in any situation that any doctor would not allow him to be in. We've gone to the best doctors around. We've been with Dr. Alan Crandall, who did the cataract surgery. We also went with Dr. Thomas Chiu, who was another of the surgeons. They both said he could continue on with his career. Because, let me tell you; if they were to tell us, ‘Y’ know what? You cannot continue with this career,’ we would not look for anybody else or any commissions to get him licenses to fight,” Diaz insisted. 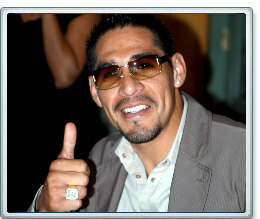 Diaz zigzagged across the country as he went with Margarito to New York and back to the West Coast. He says that his boxer, now in Tijuana, is not suffering from any jet lag. Word is that certain members of the Association of Boxing Commissions put a lot of heat on New York to have Margarito's license denied. The theory is that they wanted to flex their muscles and get a payback on Arum, who took Margarito last year to Texas after getting turned away by Nevada. This was nothing more than a vendetta against a fighter and his promoter. Regardless, it's another example of why I've never been completely sold on the idea of a national or federal commission. While it sounds good in theory, what if the wrong people are put in charge of such a body? And I'm strongly in favor of states’ rights. Sorry, but boxing doesn't need three or four people who think they rule boxing. Besides, who regulates the regulators? As for the issue of whether or not anyone who has an optical lens put in his eye should be fighting, well, I remember many years ago when Sugar Ray Leonard retired because it was believed that anyone with a detached retina should not be boxing. Well, nowadays, you have had a multitude of fighters who have suffered a similar injury and went on to fight with the aid of modern medical advances. Who's to say this isn't the case here? Yeah, I know; Margarito's right eye doesn't look the same but I'll take the words and expertise of noted physicians who were willing to stake their professional reputations on the line by signing off on his health. Hey Steve. I'm surprised you didn't have more words for the best single episode in 24/7 history. I thought for sure you'd say that Margarito was channeling the pre-prison Carlito Brigante (http://www.ivid.it/fotogallery/imagesearch/images/carlitos_way_al_pacino_brian_de_palma_023_jpg_msxi.jpg), or that you'd quote the Simpsons and say that Antonio had crossed the line from everyday villainy to cartoonish SUPER villainy, or that if he lost to Cotto, Margarito could fight Mayorga in a rare heel vs. heel matchup like when the Four Horsemen faced The Freebirds. Maybe in your next column. But anyway, is this 24/7 going to be shown on other networks the way the Pacquiao-Marquez one was? THIS is the kind of build-up that needs to be shown to the general public. I showed three different non-boxing-fan friends of mine the clip of Cotto and his Mom talking about Miguel Sr, followed by Margarito, cloaked in shadow like Darth Maul, callously asking why Cotto "cries so much," and now ALL THREE of them are coming over to my place to watch the fight. Before that five-minute clip from 24/7, these people thought Cotto-Margarito was something they'd order with their flautas at Chevy's; now they want to watch Darth Tony get the Sith kicked out of him by Cotto. Please give this memo to HBO: give the 24/7 treatment to lesser-known action fighters in intriguing matchups with stories behind them, instead of wasting time showing how many more useless people Manny Pacquiao has added to his entourage or what new and creative way Floyd Mayweather can make a jackass of himself. Seriously, do those two even NEED 24/7 to sell PPVs anymore? Keep up the great work. Jim, I couldn't have said it any better. And yes, that was one of the most- if not, by far- compelling episodes of “24/7” that I can recall. And I have a feeling with all the stuff that took place the past few days that the second chapter will be just as interesting. This will be one of the most electric nights in recent boxing memory. There is no need for any contrived storylines or controversies here. These two guys flat out don't like each other and the Puerto Ricans want revenge. This won’t be for the faint of heart. More of Steve Kim's recent work is linked below his contact information.